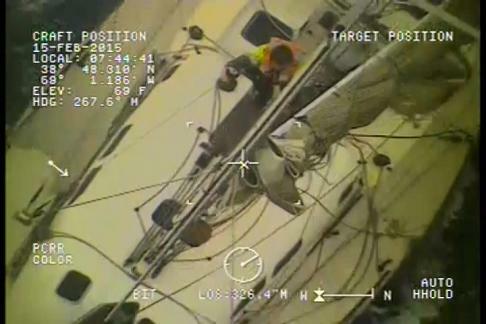 BOSTON — Coast Guard crews responded to an offshore distress call from a 43-foot sailing vessel that was disabled and adrift in a winter storm about 150 miles south of Nantucket, today. Watchstanders at the First Coast Guard District command center in Boston received an alert beacon signal at about 4:50 a.m. from the sailing vessel Sedona, and contacted the two men via satellite phone. The operator of the Sedona reported the vessel was without power and its sails were torn in the storm. He requested he and his father be removed from the vessel due to the degrading weather. Watchstanders at the command center directed an MH-60 Jayhawk helicopter crew from Coast Guard Air Station Cape Cod to launch. Faced with worsening storm conditions, the aircrew launched successfully, but due to ice and low visibility the HC-144 Ocean Sentry support plane was unable to launch. Meanwhile, the command center issued an emergency request broadcast to ships in the area. The crew of the 600-foot motor vessel Maersk Katalin, about 40 miles away at the time, set a course toward the scene and agreed to provide communications support. After navigating through low visibility and near hurricane force winds, the aircrew arrived on-scene at 8:48 a.m., and hoisted the men to safety. They landed safely at Air Station Cape Cod at 10:50 a.m., and transferred both men to local EMS to be evaluated for cold weather injuries. None were reported. Initial on-scene weather conditions were nine-foot seas and building, with 40-mph winds. By the time the crew was recovered, conditions had deteriorated to 25-foot seas and winds of nearly 60 mph. Seas are forecasted to build to 34 feet into the evening. The water temperature was 43 degrees and the air temperature was 35 degrees.